Marketing Mix Modeling (MMM) involves the use of advanced statistical techniques coupled with a deep understanding of the specific markets to measure the performance of the marketing mix. MMM techniques play a key role in improving performance by enhancing the effectiveness of marketing and reallocating spending for increased marketing ROI. By applying a holistic, commercially focused approach to marketing mix modeling, businesses can gain a much more accurate read on the ROI of their marketing investments. With the evolution of marketing mix models, the cross-functional involvement has expanded considerable leading to major improvements in the value delivered in the form of increases in sales, profit, and shareholder value. 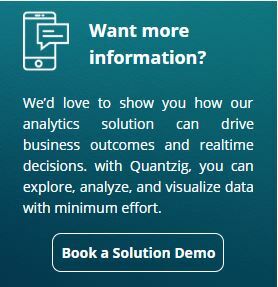 We at Quantzig offer customized marketing analytics solutions that help organizations to establish investment synergies that offer an accurate attribution of ROIs. Did you know? Applying fact-based marketing mix ROI optimization solutions to your marketing investments can drive 40%-50% improvements in your marketing effectiveness. The client – a multinational retail banking company of British origin. Founded in the year 1992, the retail banking company is one of the largest banks in the world. With its headquarters in the U.K, the retail banking company is well-known for offering a portfolio of financial services for its huge clientele all over the globe. Traditionally retail banking firms set their marketing budgets on the basis of the previous year’s revenue, often leading to wasteful spending and suboptimal results. To overcome such challenges and achieve better results a retail banking firm decided upon leveraging marketing mix modeling to determine an optimal budget that efficiently allocates spend across different platforms to increase customer equity and shareholder value. To determine the right marketing mix elements and enhance marketing productivity leading retail banking companies are now turning to marketing analytics. Our expertise in marketing mix optimization enabled us to examine the relationship between the marketing mix elements and performance measures such as sales and market share that represent the outcome of a precise retail banking marketing plan. As a part of thie engagement recommended changes in the retail banking firm’s marketing plan, this, in turn, helped them improve revenue while meeting their set business goals. Along with ascertaining the effectiveness of each marketing input in terms of ROI, it proved to be beneficial in driving improvements in the overall marketing effectiveness of their campaigns. Moreover, the right use of marketing mix elements and the appropriate modeling techniques positively impacted the retail banking firm’s ROI, which remarkably increased by 55%. You’re just a click away! Get in touch with us to get your marketing strategies right. Copyright © 2007-2019 Infiniti Research Limited. All Rights Reserved.